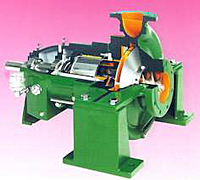 Magnetic coupled DICKOW-pumps of the series PRM according to API 685 are heavy duty sealless pumps. The containment shell forms a closed system to separate the pumped liquid from the atmosphere by confined gaskets. The equipment (including auxiliaries) is designed and constructed for a minimum service life of 20 years (excluding normal wear parts) and an uninterrupted operation of at least 3 years. Magnetic coupled PRM-pumps improve plant and personnel safety and reduce maintenance costs, because 90% of these costs are caused by lea king seals. The PRM-pumps will handle nearly all kinds of liquids in the chemical and petrochemical industry, in refineries and industrial heating plants. Especially liquids which are toxic, flammable, bad smelling or which react on contact with the atmosphere, that means if no leakage is acceptable. For all these services the containment shell replaces the double acting mechanical seal with its external flushing system and the related control equipment. The performance range of the PRM-pumps is subdivided such that the best efficiency is guaranteed for all service conditions. The capacity goes up to 900 m3/h (4000 USgpm), the differential head up to 150 mLC (500 ft).